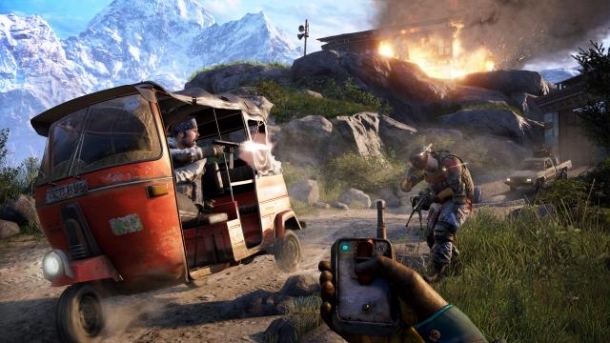 Far Cry 4 is an open world first person shooter, with what seems like a lot of elements borrowed from Far Cry 3. Players will be able to freely explore the island at their leisure while completing main story missions, side missions, and other objectives. Players can take out enemies, hijack vehicles, and use aircraft such as helicopters. This following pages detail the weapons contained in Far Cry 4. The helicopter, though it is unkown whether one will be able to drive it, is a rideable vehicle within Far Cry 4. The player can use the manned machine gun to take out enemies from above. Ubisoft has officially announced three different editions for their latest game, Far Cry 4, with details on the following pages. The following pages detail various media released for Far Cry 4. Games I own on Ubi Soft's Uplay Store.